A police raid in Glasgow has recovered a £30m Leonardo da Vinci painting stolen more than four years ago. Three men from Lancashire and one from Glasgow were arrested as officers found the Madonna with the Yarnwinder, taken from the Duke of Buccleuch's estate. 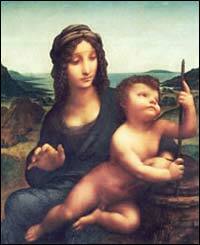 Art experts confirmed the painting was the one stolen in August 2003. The artwork was taken from Drumlanrig Castle, near Thornhill, in Dumfries and Galloway. Four anti-crime agencies were involved in the Glasgow raid. Police said that, acting on intelligence, they intercepted a meeting between five people in the centre of Glasgow at about 1100 BST. The painting was recovered at the scene. Four men have been arrested and will appear in Dumfries Sheriff Court on Friday. Police will not confirm further details but it is understood a deal for the sale of the painting may have been under negotiation. The work was taken to a vault for formal identification. The operation was led by Dumfries and Galloway Police and involved the Scottish Crime and Drug Enforcement Agency (SCDEA), Serious Organised Crime Agency (SOCA) and Strathclyde Police. "We are extremely pleased to recover the Madonna with the Yarnwinder painting," said lead investigation officer Det Ch Insp Mickey Dalgleish. "The recovery of this artwork is down to extensive police enquiries and the combined efforts of several Scottish police forces, the SCDEA and SOCA. "For four years police staff have worked tirelessly on the theft and with help from the public we have been able to track down and locate the painting." The theft sparked a worldwide search, with the FBI putting the painting on its list of 10 most wanted pieces of stolen artwork. The painting had been in the Buccleuch family for almost 200 years and had been admired by thousands of visitors to the castle every year. The discovery of the artwork comes just a month after the death of the Duke of Buccleuch. He died at the beginning of September at the age of 83.